For nurses who are so used to caring for other all the time, a timely resource – and a call to action towards health and fitness – from a nurse. Terri Wentzell can no longer keep quiet about the conditions that beset nurses and caregivers: long hours, minimal breaks, excessive stress, and overload patient assignments. Concerned that they might not have the ability, time, or tools to actually care for themselves, she published “Nurse Gone Strong: Health, Fitness and Total Wellness for Nurses” (CreateSpace, 2017). As its title suggests, “Nurse Gone Strong” promotes health, fitness and total wellness among nurses who always make sure the patients’ needs are met before worrying about themselves. But as the backbone of the healthcare sector and the very people that patients trust (other than the physicians), nurses should be in optimum health, serving as a role model for health and wellness for generations to come. The resource contains topics that nurses should be aware of. After taking her intended readers through the essence and challenges of being a nurse, she takes them to goal-setting and self-assessment, diet and lifestyle changes, nutrition, physical fitness (the author recommends yoga! ), stress management, toxin reduction, and building self-esteem and positive body image. “Nurse Gone Strong” should encourage nurses to start their journey towards health, fitness and total wellness. Nurses deserve better and it is time they start paying themselves first in terms of health. 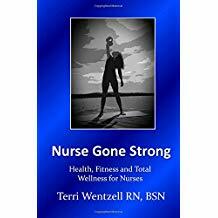 Terri Wentzell’s “Nurse Gone Strong: Health, Fitness and Total Wellness for Nurses” will soon be displayed at the upcoming 2018 Frankfurt International Book Fair on Oct. 10 to 14, 2018. Copies are available at Amazon (https://www.amazon.com/Nurse-Gone-Strong-Terri-Wentzell/dp/1544936559) and Barnes & Noble (https://www.barnesandnoble.com/w/nurse-gone-strong-mrs-terri-lynn-wentzell/1126262453). Terri Wentzell has been a registered nurse for over 20 years. She is also a certified personal trainer, wellness coach, fitness nutrition coach, and sport yoga instructor. Terri has seen first hand over the years how nurses are so amazing at caring for others all the time… but what about themselves? The nursing profession is tough, physically, mentally and emotionally. It’s time to care for the nurse!